HOME2018 RACEPREVIOUS RACESPHOTO GALLERYHOW TO ENTER HEAD STARTSDIPSEA HISTORYTHE COURSEVOLUNTEERDIPSEA FOUNDATIONCLUBS & LINKSOUR SPONSORSCONTACT USQUESTIONS? Brian Pilcher suspected he would win another Dipsea race. He never expected it to be by such a wide margin on Sunday. 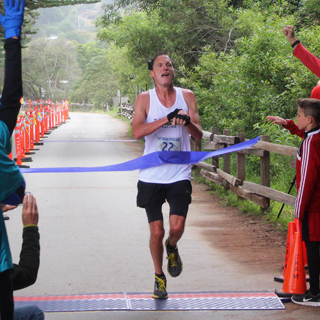 Pilcher, a retired 58-year-old real estate financer from Ross, outran the field of 1,500 runners on the 7.4-mile course from downtown Mill Valley to Stinson Beach to win the 105th Dipsea. His one minute and 58 second victory over second-place finisher and first-time Dipsea runner Matias Saari, 44, of Anchorage, Alaska was the largest margin of victory since 2003 when Melody-Anne Schultz won the second of her three Dipsea championships. The win was Pilcher’s second Dipsea triumph. He won the race six years ago by 32 seconds. This one, however, came only one year after Pilcher finished a disappointing 22nd in the Dipsea when he decided to compete with an injury. In his second ever Dipsea race Rickey Gates, 34, of San Francisco finished third in a time of 49:11, wrestling the Fastest Time Award trophy away from scratch runner Alex Varner of San Rafael, who had won it a record six times previously. Chris Lundy, 44, of Sausalito placed fourth and won the Fastest Female Time Award despite experiencing flu-like symptoms on Saturday. “The only runner I was worried about was Chris Lundy,” said Pilcher, who took the lead for good Sunday when he passed 75-year-old Hans Schmid, the 2012 Dipsea champion, after Cardiac Hill near the halfway point of the trail race. Pilcher's winning time was 56:56. Lundy, who finished second in the Dipsea in 2012 and 2013, gained an extra minute head start this year in the time-handicapped race which awards head starts based on age and gender. She thought she had recovered nicely from a bike accident in Half Moon Bay in January, but her Dipsea training suffered a setback when she became ill on Friday. “If I run the time I thought I should, I would have been very close to (Pilcher),” Lundy said. Lundy ran two minutes slower than she had hoped and finished 2:27 behind Pilcher. Heath Hibbard, 62, of Montrose, Colo. was fifth. Varner placed ninth overall yet, along with teammates Saari, Gates, Alan Reynolds and Gus Gibbs, helped the Pelican Inn Track Club for the second year in a row win the Team Trophy, edging out the Tamalpa Runners Club, which had won the trophy 36 times in the previous 37 years. Diana Fitzpatrick, the 57-year-old two-time defending Dipsea champion from Larkspur, placed 11th overall. She was among the 35 Dipsea black T-shirt winners that included 57-year-old Bradford Bryon of Penngrove, who became the third runner in Dipsea history after Russ Kiernan of Mill Valley and Steve Stephens of San Anselmo to win at least 20 black T-shirts in Dipsea history. Quinn Lehmkuhl of North Tahoe High School was the first girls high school finisher and 14-year-old Drake High School runner Wyatt Miceli was the first boys high school finisher. Miceli, who placed 16th overall, and his half-brother John Lawson of Forest Knolls won the Alan Beardall Family Trophy. Fiona Cundy, 27, of Oakland was the first runner from the Dipsea Runners Section to finish. The Dipsea – the oldest trail race in America and the country’s second oldest footrace behind the Boston Marathon – had a starting field representing 31 states plus the District of Columbia, Australia, Canada and the United Kingdom. Entrants ranged in age from 7-year-olds Kristen Slatter of Mill Valley and Max Pasquale of Novato to 81-year-old Barbara Robben of Berkeley and 80-year-old Bill Dodson of Mountain View. In addition, for the first time in the 110-year history of the Dipsea, the race was live streamed over the Internet by UltraSportsLive.TV. It is a tight, tricky and sometimes treacherous 7.4 mile cross country romp following the scenic and historic Dipsea Trail over hill, dale and three flights of steep stairs totaling 688 steps climbing to a peak elevation of 1,360 feet (the equivalent of a 50-story building) while continuing around the south flank of Mt. Tamalpais through Muir Woods and Golden Gate National Recreation Area. It ends at Stinson Beach where some of the limited field of 1,500 runners will cool off in the Pacific Ocean then attend the post-race awards ceremony hosted by Barry Spitz, the newest inductee into the Dipsea Hall of Fame. Longtime Dipsea runners and volunteers Sharon and Colleen Fox were named the winners of the Jack “Demon Dipsea” Kirk Award for “dedication, perseverance and performance over time.” The sisters’ history with the Dipsea dates back to the 1920s when they great aunt Minnie participated in the Dipsea women’s hike. The Dipsea’s Red Tail Hawk Award, also known as the Jerry Hauke Perpetual Award, for “leadership, dedication and sportsmanship” was presented Billie Post, the widow of Dipsea elite runner Steve Lyons. She competed in the race for 26 years and has transitioned into the post-race awards captain for the Dipsea. The Norman Bright Award – given for “Extraordinary Effort in the Dipsea Race” – was presented to 77-year-old Norman Pease, who has competed in the Dipsea for 33 years including one year when he raced one week after surviving a single-engine plane crash. Longtime volunteer Bob Long was recognized for 50 years of service to the Dipsea. "Extraordinary Effort in the Dipsea"
Check back for more news about Dipsea Race events!